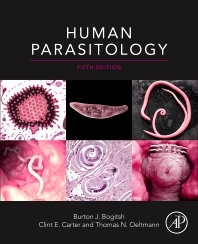 Human Parasitology, Fifth Edition emphasizes a medical perspective that also incorporates functional morphology, physiology, biochemistry and immunology to enhance appreciation of the diverse implications of parasitism. Bridging the gap between classical clinical parasitology texts and traditional encyclopedic treatises, the book will not only appeal to students interested in the medical aspects of parasitology, but also those who are interested in gaining a solid foundation in the biology of parasites. This updated edition has been fully revised to integrate the most recent molecular discoveries about mosquitoes, ticks and other arthropods as vectors, along with the most effective therapeutic regimens for each. Burton J. Bogitsh received his undergraduate education in biology at New York University (University Heights) and his graduate education at Baylor University (M.A.) and the University of Virginia (Ph.D.). He is currently Professor Emeritus of Biological Sciences at Vanderbilt University. He has authored more than 100 publications in the area of parasitology and has co-authored a textbook in General Zoology. He is an associate editor of the Journal of Morphology, co-editor of Volume 2 of the Microscopical Anatomy of Invertebrates, and has contributed many chapters to numerous edited volumes on parasitology. His research interests are in the ultrastructural localization of enzymes in helminths with a primary focus on the digestive tracts of trematodes. Dr. Carter received his B.A. and M.A. degrees in biology at Loma Linda University and his Ph.D. degree at the University of California at Los Angeles. He is currently Professor Emeritus Biological Sciences at Vanderbilt University. He has authored more than 70 publications with a primary focus on the biochemistry and immunology of parasites. He has contributed chapters in several edited volumes such as The Biology of the Tapeworm, Hymenolepis diminuta, and has served on the editorial board of the Journal of Parasitology. His current research interests are centered on the host-parasite interactions of the causative agent of Chagas’ disease, Trypanosoma cruzi.